Every other week or so, I go on a prayer-walk around my church building. Sometimes I pray more attentively when I am moving instead of holding still. I just walk around our one square block a few times, silently listening and talking to God. Mostly I pray for the people in our community, leaders and attendees and visitors alike. 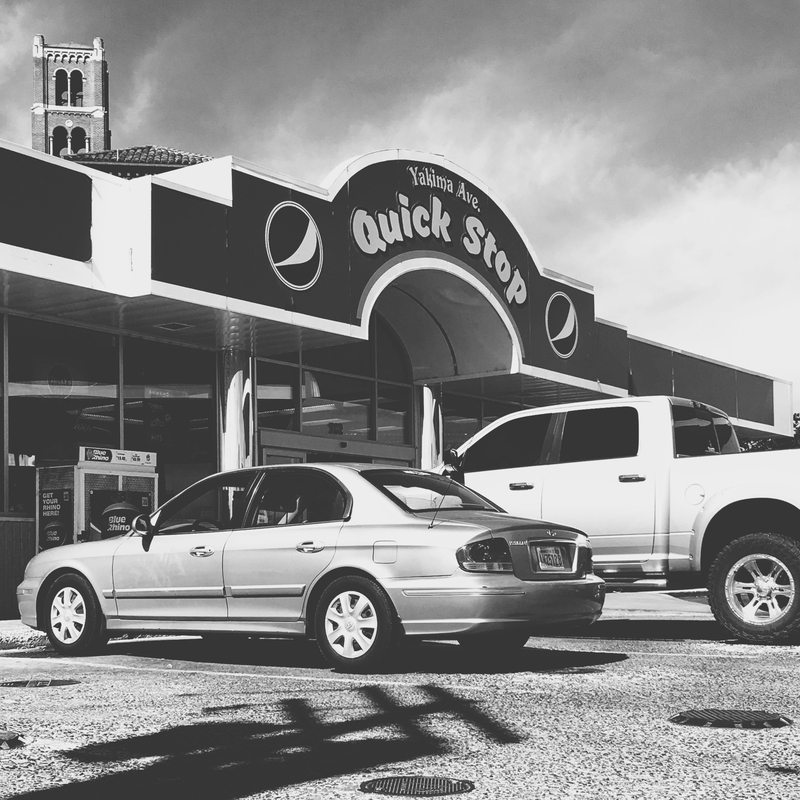 Anyway, we share our square block with only one other building – a mini mart /gas station. Our church building is huge and beautiful, built over 100 years ago as a spiritual beacon of its time, red brick and perfectly manicured landscaping. The mini mart is medium-sized (for a mini mart), is reputed to have the cheapest gas in town, is on a busy downtown corner where a main road ends to flow into another main road, and its sign has a big, gaudy corporate sponsor. You get the picture. Well, our church property butts up against the property of corner mini mart in such a way that it is basically impossible for me to walk around our church building only and bypass the mini mart. I was thinking about this fact on my last prayer-walk and for a moment I thought: It would be so much more aesthetically, purely beautiful if my one square block prayer-walk wasn’t forced to include the corner with the eyesore of a mini mart. But then it dawned on me just how much our one square block is actually more beautiful because of the mini mart, not less. After all, the mini mart is a place where anyone and everyone is welcomed, no matter how you’re dressed, what your skin color, what language you speak, how lost you are on the map, what need you have. I mean, at least they’ll try to help you as best they can. And life – at least the life I see when I open up my eyes in the morning and read the news and listen to people’s stories – is not perfectly maintained and manicured. It is a mess! – much more like a greasy mini mart than a gorgeous, brick holy building. So, if the mini mart represents reality and hurt and brokenness, it makes our one square block more beautiful – if only for its honesty. It made me wonder if you took a poll on that corner which building people would choose if asked which place felt more intimidating, more safe, more welcoming, more helpful in their daily life: the church building or the mini mart? It is so tempting for me to bypass the mini mart, to stay where I’m comfortable, to enmesh myself in emotionally safe surroundings, to give hurting people trite Bible verse quotes in exchange for their vulnerable tears. Shame on me. So today, I’m going on a prayer walk. And I’m embracing and celebrating and feeling overwhelmingly grateful for the mini mart and all that it represents on our one square block.